The multiple stresses of contemporary life--whether from excessive sports play, overwork, or overuse of technology--are increasingly taking a toll on the body. Symptoms range from muscle soreness and pain to pinched nerves to potentially more permanent disabilities, including serious body injuries. One safe, quickly productive way to address the problem is through a simple therapy that can be done anywhere, anytime, and without special equipment: stretching. This new edition of Brad Walker's best-selling book on the subject presents 135 unique stretching exercises designed to help repair the body and make it more flexible, fit, and relaxed. The book begins with clear, detailed descriptions of important principles of anatomy and physiology, the benefits of stretching, different forms of stretching, rules to remember, and how to stretch properly. It also focuses on the kinds of stretches that are most helpful in the alleviation or rehabilitation of specific sports injuries. 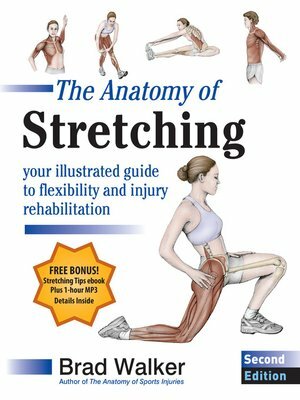 Organized by body part, The Anatomy of Stretching presents stretching exercises in a uniform style accompanied by full-color anatomical illustrations. Equally useful for fitness fans, pro or amateur athletes, coaches and personal trainers, and healthcare practitioners, this new edition contains 20 new stretches; expanded physiology and anatomy information; and a revised numbering system that makes the stretches easier to reference. An expanded appendix includes a longer resources section and a helpful chart describing the top five stretches for each sport and sports injury.